Kendra White of Republic, Missouri, is a wife, mother and hobby photographer. And thanks to an unusual partnership in Missouri, she can add a career as a pharmacist to her list of accomplishments. “This would not be possible if the UMKC School of Pharmacy hadn’t opened a campus in Springfield,” says White as she eats breakfast with her sons Ryder, 10, Roland, 7, and Rayden, 5, before they all leave for school. The pharmacy school campus at Brick City, in Springfield’s revitalized downtown, is a 20-minute drive away. White was one of 31 students in the first graduating class of the UMKC School of Pharmacy at Missouri State University. “I’m beyond excited,” says White, who landed a job as a pharmacist at HomeTown Pharmacy in Mount Vernon, Missouri. Funny how life works, but that’s where she started working as a pharmacy technician nearly 20 years ago, introducing her to the profession. “My career has come full circle,” she says. With its unique university partnerships, the UMKC School of Pharmacy has hit upon a successful formula for increasing the number of health-care professionals in rural Missouri. The Springfield campus opened in August 2014, joining a satellite campus at the University of Missouri in Columbia that opened in 2005. 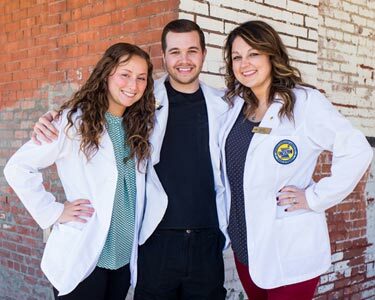 A large number of the Columbia pharmacy graduates have taken their first jobs in and around central Missouri and surrounding rural areas. They call themselves “TigerRoos,” a mashup of the two universities’ mascots. “We never settled on a good nickname in Springfield,” says White, laughing about the many iterations of the Kangaroos (UMKC) and Bears (MSU) they tried to mix. The 15,000-square-foot Brick City space in Springfield features three classrooms with video-conferencing equipment that supports the transmission of classes among the Kansas City, Columbia and Springfield sites. It lets students interact with professors and other students during lectures regardless of their location — like a “fancy Skype,” as some students describe it. “It’s been an amazing experience getting to know people here at school and on the other campuses,” White says. Prior to the two satellite campuses, UMKC School of Pharmacy faculty couldn’t help but notice a pattern: After students graduated with their Pharm.D., they would establish roots in the Kansas City area, leaving other parts of Missouri underserved. “That’s been an issue since I graduated 40 years ago,” says UMKC alumnus David Eden (B.S.P. ’78), mayor of Mount Vernon, Missouri, and a pharmacist at HomeTown Pharmacy. Eden is retiring, opening up the position White is filling.